The new Sinn 556 I B features a case size at 38.5 mm which is satinized. This finish results in a slightly more polished look without the shiny "mirror look". In addition, the dial features applied hour indices for a very clean layout. This watch is fitted with a Sinn dark blue calf leather strap and tang buckle. "Sinn 556i b - A dressy tool watch"
Verified Owner Comments: I've been refining the collection to just a few pieces. 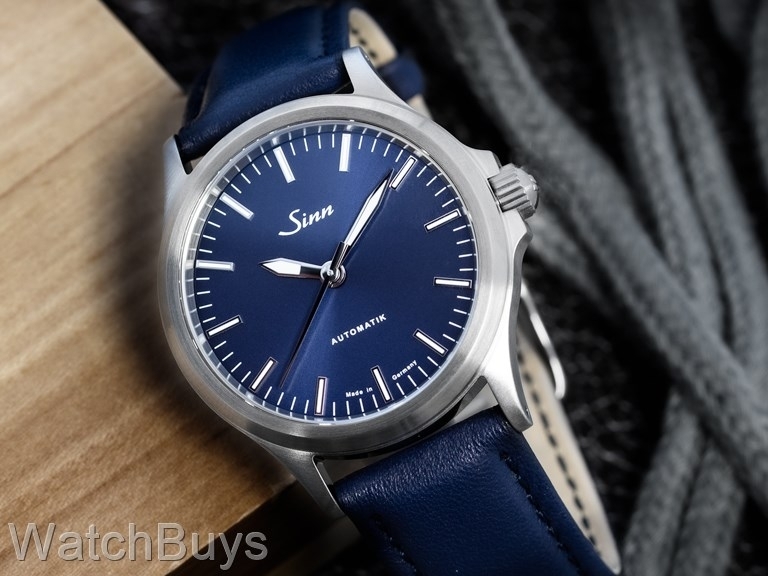 This is the second Sinn I have purchased from Jon at Watchbuys. As always, impeccable customer service, excellent communications and prompt shipping. The watch is perfect. It is dressy enough to use for my corporate officer and portrait photo shoots and the occasional sport jacket. It is a tough watch that is simple, elegant and beautiful in its starkness. My other Sinn is a 104i and they compliment each other in purpose and looks. To my eye, I prefer the German watches over the better known Swiss brands. I am a fan of the form over function approach and the Sinn fits right into this way of thinking. Verified Owner Comments: The Sinn 556 Blue is a great add to my collection. The near perfect size, vibrant blue dial, exciting case back and commitment to doing one thing really well makes this a great piece to wear and enjoy. Highly recommended - any color, any style. "Sweet blue and satinized steel"
Verified Owner Comments: Bought two 556’s, the Blue and a Mocha. Pleased with each. Gave my business partner his choice as a gift (30 years since starting company), and he chose the blue. The blue dial is great, but it’s the case that does it for me. Verified Owner Comments: You can’t get a much better watch than a Sinn 556. Why get an IWC Pilot when the Sinn 556 is just as good (better) at less than one third the money? The IWC has an in house movement, that’s true. But I really think that many in house movements are overrated as well as overpriced. Are the Beatles better than the Rolling Stones? Are Sinns better than Rolexes? Can a person walk around with $9000 attached to his wrist? I love this Sinn 556 I B with the blue dial. I’m not one of those fellows with ten watches. This is going to be my watch for the next ten years. I couldn’t be happier with it. A classic look with classic proportions but modern inside. "Great version of the 556 I." Verified Owner Comments: This version of the 556 I with slightly thinner indices and hands give a nice refined look. The blue dial is stunning in person. Good size/thickness for wearing with dress clothes and looks great with jeans.